Happy mail day for me! I told you already that I'd joined the Goodie Bag Swap on Flickr. Well, my international parcel was waiting for me when I got home from work today! The package said open immediately, so I had to obey. I ripped open the envelope and . 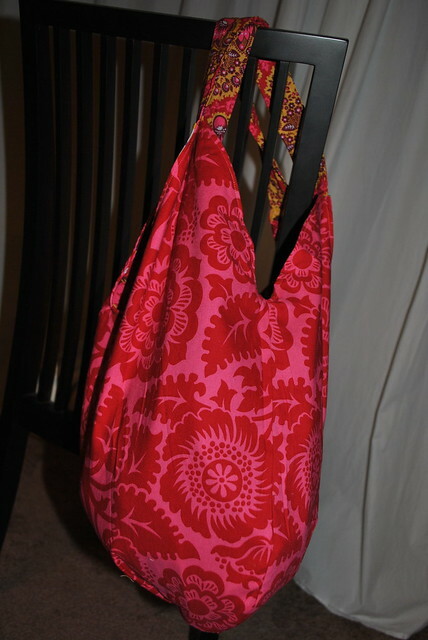 . .
Found this lovely, roomy, pretty bag sewn from Joel Dewberry Heirloom! 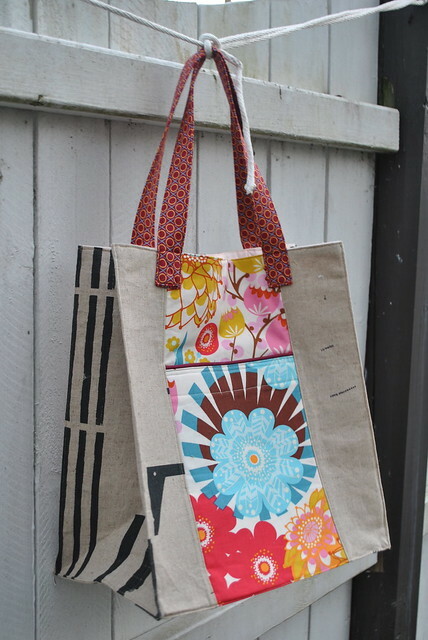 The pattern is the Practical Bag by Grand Revival, and it is the perfect tote to throw over your shoulder and grab packages for the post office (which is me a lot these days). 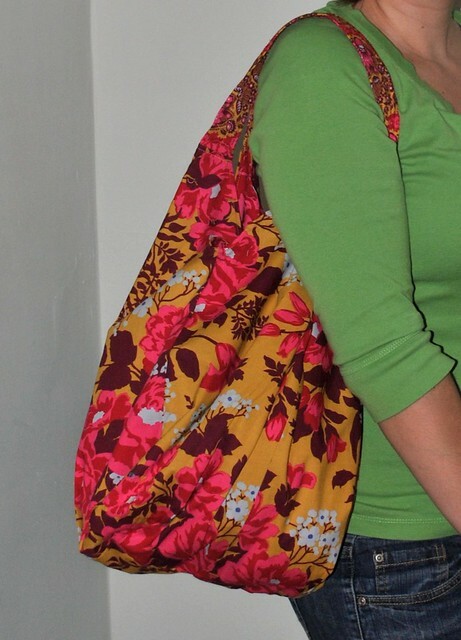 This bag and fabric are just my style, and Vicky (Patchwork Queen) did such a great job on the details. It's also reversible, which is super fun! The inside fabric is also from Heirloom, Blockprint Blossom. Love! Vicky is from the U.K. and included some fun extras like these London-inspired toothpicks (I was so tempted to put one in my sandwich), a sweet little owl ornament and a collection of fabric scraps from her stash. The owl is going on my Christmas tree, which is still in a box. Anyone else have this problem? I'm usually a Thanksgiving weekend tree decorator, but this year . . . Earlier today I found out that the Jane Market Bag I made for my secret partner is one of the Wearables finalists for Celebrate Color. There are some fabulous projects from many of my blog friends, so I'm really happy for all of them to be recognized and have a chance at the prizes! You can vote for your favorites in all four categories through Wednesday. I love the fabrics your partner used on your bag! A fun bag like that has to make the post office trips more bearable. 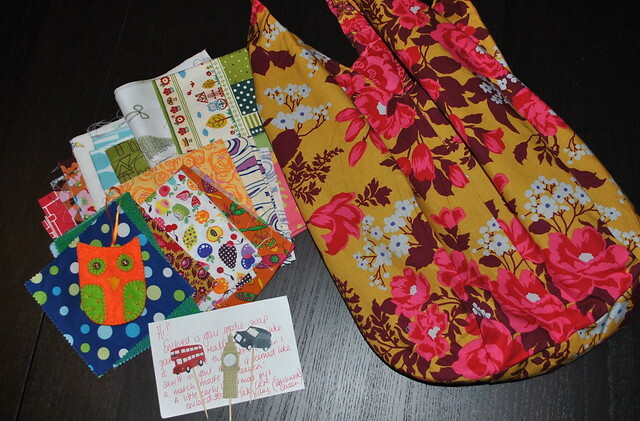 Looks like you had a great swap! I also voted for you earlier this evening! Congratulations! Nice package! I love both sides - not sure which one I'd choose to wear first. 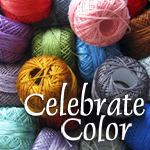 Congrats on your Celebrate Color finalist achievement. I love that bag you made! Cool that your bag is one of the finalists! And what fun mail you received too. That's a lovely bag you received, both sides are so pretty. I voted for your market bag, good luck! Cute and FUN!!!! Nice surprise!!!! I saw your bag and thought it was very special too!! How nice to have it appreciated in this way. Congratulations!! Wow, that is awesome! And what a cute JD bag!! Love the bag! It's so pretty! Love that it's reversible.